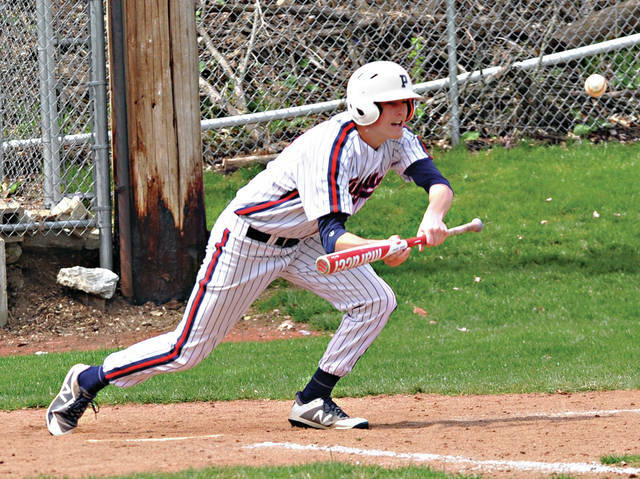 Piqua’s Blane Ouhl puts down a bunt against Urbana Saturday at Hardman Field. PIQUA — The Piqua baseball team continued on a roll Saturday at Hardman Field. After handing Tippecanoe its first Greater Western Ohio Conference American North Division loss Tuesday and defeating Stebbins 3-1 Friday, Piqua knocked off Urbana 13-3 in six innings Saturday. Piqua leveled its record at 5-5 heading into the Sidney games Monday and Tuesday, while Urbana dropped to 1-11. Not that Urbana made it easy. The Hillclimbers hung around for most of the game. Urbana took a 2-0 lead in the top of the first. Logan Johnson reached on an error and came around to score on Nick Weyrich’s sacrifice fly. Gabe Spiers doubled and scored on Austin Rooney’s single. Rooney tried to score on starting pitcher Wyatt Teets single, but Mick Karn threw a dart from center field to catcher Dylan Motter, who put the tag on Rooney to end the inning. Piqua tied it at 2-2 in the home first without a hit. Owen Toopes, Zack Lavey and Iverson Ventura all reached on infield errors. Piqua took a 3-2 lead in the second when Ethan Pohlschneider reached on an error and came around to score on Blane Ouhl’s sacrfice fly. Urbana tied it 3-3 in the third. Gabe Spears singled and scored on Teets’ fielders choice. He set down on eight of the last 11 batters he faced. Piqua put the game away with four runs in the fourth and ended it with five in the sixth. In the fourth, Mick Karn’s bases-loaded two-run single was the. only hit in the. inning. Zack Lavey had a bases-loaded walk to force in a run after Weyrich replaced Teets on the mound. In the sixth, Piqua scored five on four hits. The inning started with Weyrich hitting Owen Toopes and Lavey. With one out, Beougher and Iverson had RBI singles. Cameron Deal and Pohlschneider had RBI singles and after Dylan Motter was intentionally walked to load the bases, Ouhl was hit by a pitch to force in Deal and end the game. Teets and Weyrich combined on a seven-hitter, striking out five, walking four and hitting three batters. Piqua will host Sidney Monday, before traveling to Sidney on Tuesday, looking to continue its momentum from this week. Piqua Daily Call Sports Editor Rob Kiser can be reached at rkiser@aimmediamidwest.com.